Middlesex chief executive Richard Goatley says "it's time the county had a second ground" as they look to play more matches away from Lord's. Next year's World Cup, plus a planned £50m redevelopment of the Compton and Edrich Stands, are among the pressures on its future availability. Goatley believes Middlesex need a "stable base" to grow the club at all levels as a year-round business. "It's going to be complicated and a lot of work," he told BBC Radio London. "But, supporters will love it when it's there and we need a second home. It needs to be not too far from Lord's ideally." Middlesex home matches away from Lord's this season have taken place at Merchant Taylors' School in Northwood, Uxbridge, Richmond and Radlett. The club also has its indoor school based in Finchley where various squads also train. "There's conversations taking place at the moment with both the ECB and potential funders," Goatley said. "I'm really excited about the potential of building a community ground where the asset is really busy. "Too many county cricket grounds are too quiet during the winter months. So it needs to have some sort of indoor facility." 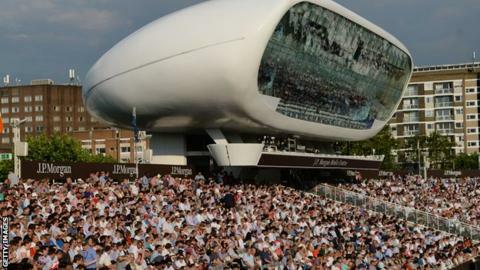 Lord's has been Middlesex's home since 1877, but is owned by Marylebone Cricket Club (MCC).